As the youngest sibling, I lived at home with my parents alone, and my mom and I would often buy apple turnovers to split together. It was our little tradition. Since I had just gone to the apple orchard right before her birthday, I decided it was time to give homemade glazed apple turnovers a try for her birthday treat! We were all so happy with them that I am thinking this might make a Thanksgiving appearance – with the perfect flaky crust and warm apple filling – it seems perfect for a fall holiday! I heard someone mention before that they used puff pastry for the apple turnovers, so I decided to experiment. I am so happy I did! The puff pastry was easy to work with, and I now have a new favorite recipe to make. Peel, Core, and Chop up the apples into small pieces. Put the apples into a large saucepan with the rest of the filling ingredients, and cook over medium heat until bubbling. The mixture should thicken. Flour your work surface to make working with the puff pastry easier. After the puff pastry sheet is defrosted a little bit, cut into four equal squares; I use a pizza cutter and make two cuts. 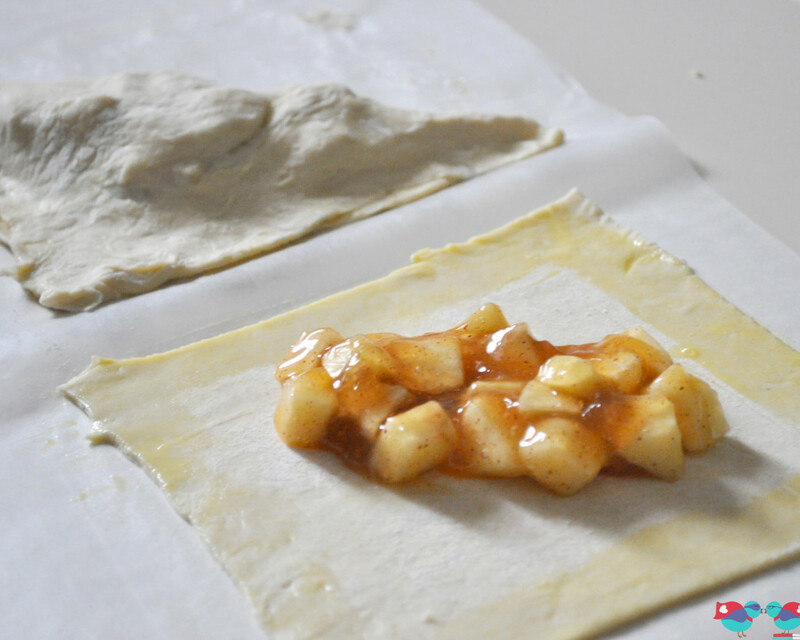 Put a spoonful of filling on each square, keeping in mind you will be folding the pastry over diagonally. Make sure you get some filling into what will be the corners without getting to close to the edge. Then, fold over the pastry diagonally and press the seams together. Take a sharp knife and make two little cuts into the top of each turnover to let the steam out. Put your turnovers on a parchment paper on a cookie sheet and then use your pastry brush again to put some egg on top of the turnovers. It will give them a nice golden color. Sprinkle on the reserved cinnamon and sugar mixture (1 tsp of each) on top of the turnovers and then bake at 400 for 18-20 minutes. While the turnovers are making, mix together the ingredients for the glaze. 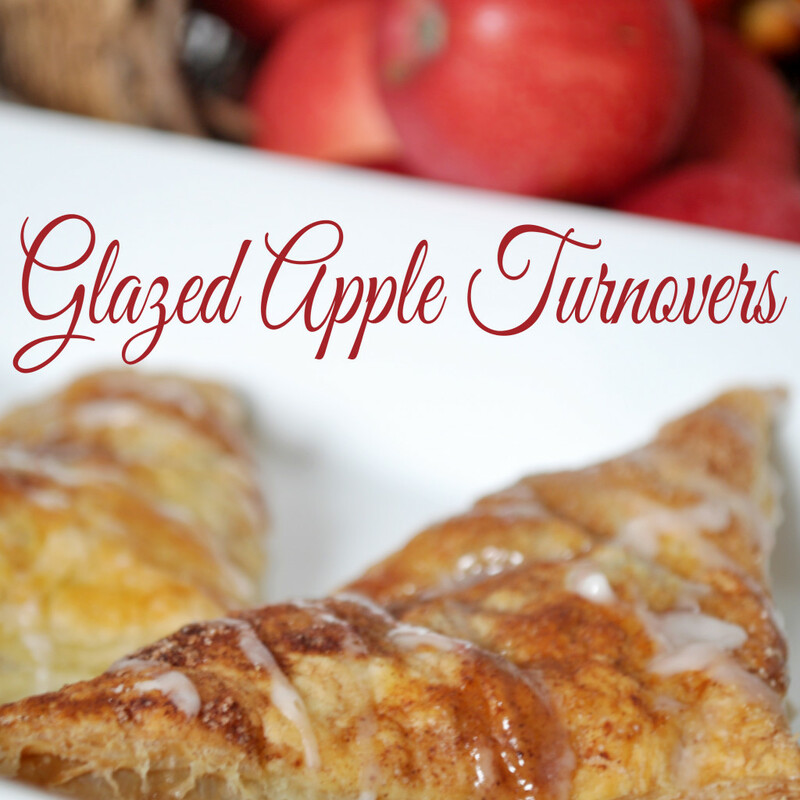 After the turnovers have cooled, drizzle the glaze onto the turnovers. Let them sit for a few minutes while the glaze hardens and then store. They do not need to be refrigerated. I hope that you will give this recipe a try, especially if you have never tried turnovers before! They are so delicious; I mean melt-in-your-mouth good! These look delicious! 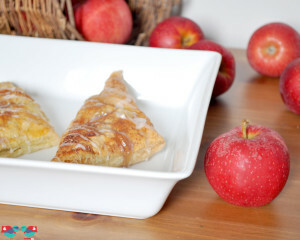 I love apple turnovers, but I never thought about trying my own. Now that fall is coming, I just might have to do this. I’m just wondering when you should be putting the cinn. and sugar on? do you put it on before you bake it or after? 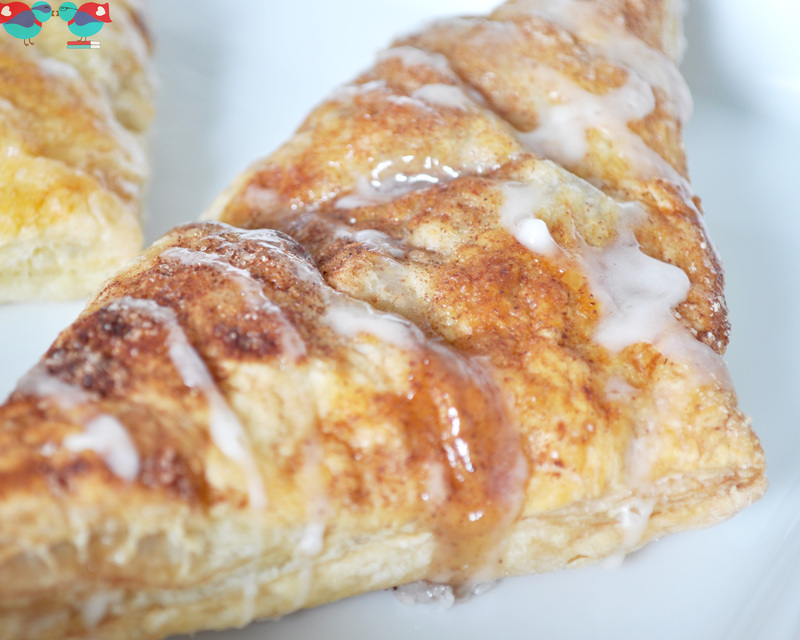 You will want to sprinkle on the reserved cinnamon and sugar on top of the turnovers after the egg and before baking. I have updated the recipe to reflect that now! 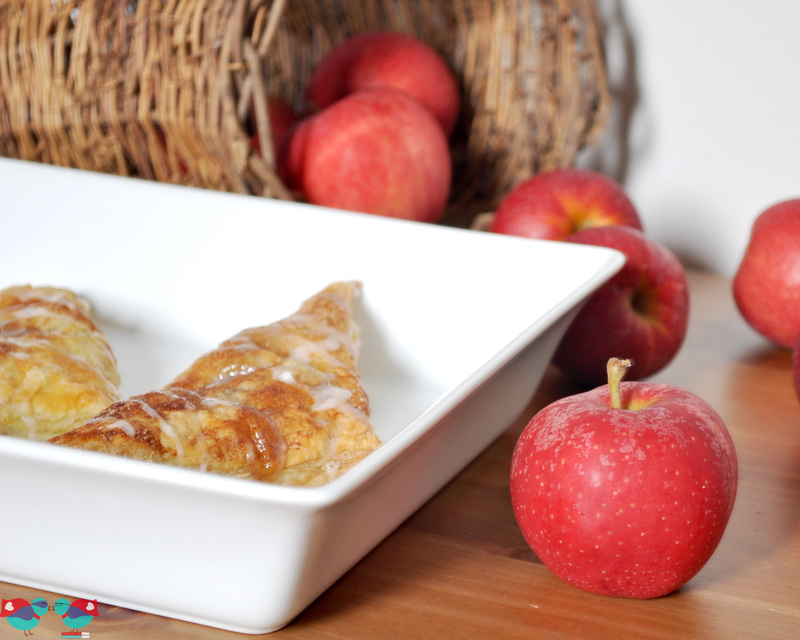 Apple Turnovers just remind me of sweet innocent childhood memories! You know the ones with the wonderful glaze on your face, and your mom laughing as she is trying to clean off your face. This recipe sounds delicious and I definitely am trying it out!! Those are definitely my childhood memories, Heidy! This is still a treat my mom will purchase or make just for the two of us. G’day These so remind me of childhood! YUM! What happened to steps 6 and 7? Absolutely nothing, Jay! Apparently I had a hard time counting that day. I just updated the recipe to reflect the appropriate number of steps. I love little traditions like sharing an apple turnover with your mom, makes you always think of her when you have turnovers I bet. I’m not a big fan of hot apples but these look so good that I think I’m going to try them anyway. If it makes it sounds better, Britni, I normally eat these cold or at room temperature.